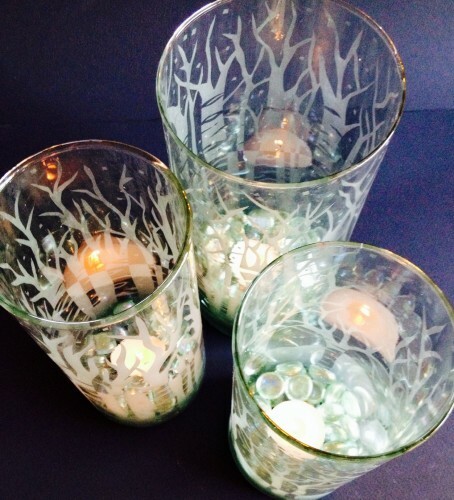 Secondhand and Dollar stores are the place to find clear glass vases and votives in all sizes. Sometimes you can find the blue ones which are extra special, but my project today was better with clear so the etched part would give it the wintery feel I wanted. 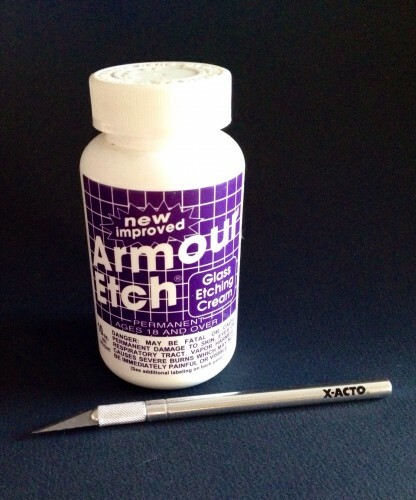 I use a glass etching cream called Armour Etch. Don’t let the word “cream” fool you. It is acid in a sort of cream-like delivery system the consistency of gritty pancake batter. I also use an X-Acto blade, and contact paper (the adhesive plastic “paper” the tenant with bad taste before you used to line her kitchen drawers which you will waste many hours and four letter words over removing in skinny, sticky strips). Because it involves acid, knives, incredibly clingy plastic, and bad language (potentially), you had better be mature and in full control of your physical and mental faculties before you take on this baby! It’ll be worth it though. See how pretty…! So, this is what I did. 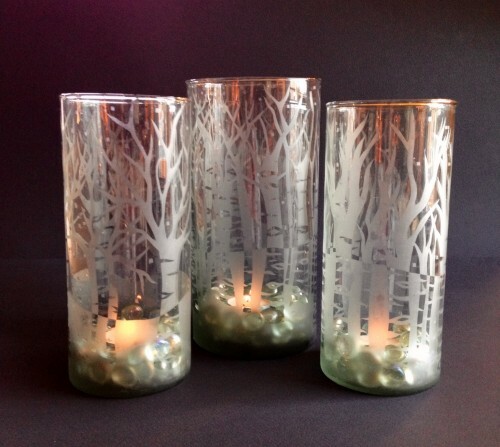 I took a clean, dry glass votive and wrapped it with the contact paper (I use the clear contact paper so I’m not distracted by images. You could use a solid colored one too if you can’t find clear, but it needs to be PLASTIC adhesive “paper”.) Then I cut away the plastic exposing the glass below using the X-Acto like I would a pen and “drawing” the outline of the image I plan to etch. 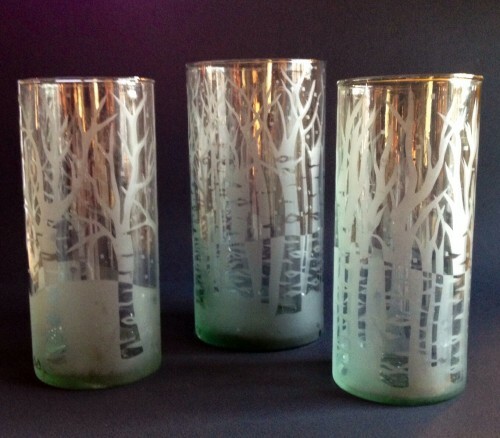 Wherever you expose the glass is where the acid will etch it and make it opaque. Once you’ve cut away all the plastic you plan to, and before you apply the acid etch, you basically have the “negative” of your ultimate piece. When you are happy with your “negative” then you brush on the acid etch. Don’t use your good brushes for this. 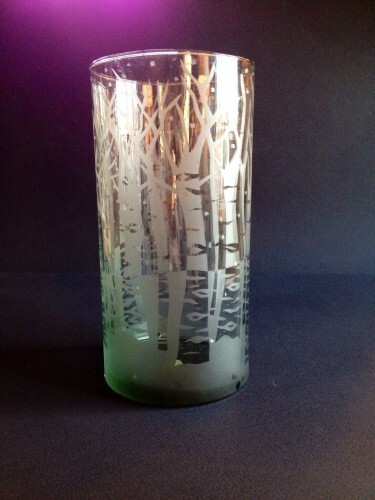 Grab one of the crappy ones that is always losing its bristles, and “paint” the acid on the exposed glass. I usually put on a couple of coats. You want it pretty thick so it etches evenly. If you don’t put on enough you get a sort of vague, cloudy day look which you can’t redo because the plastic will come off when you wash off the acid. Don’t waste the acid on the plastic parts, just generously cover the exposed glass parts, and let it sit for 10 or 15 minutes. The instructions say 5 minutes, but they are worrywarts and you will get the “cloudy day” result and invent new four letter words if you follow their advice. So don’t. When you can’t stand waiting any more, rinse it off in warm running water in the kitchen sink. Use one of those drain catcher things in the drain to catch the little pieces of contact paper that will wash off along with the acid so you don’t clog up the plumbing. Once all the acid and plastic is rinsed off then give it another gentle washing with dishwashing detergent so it’s sparkling clean. Then rinse and dry. 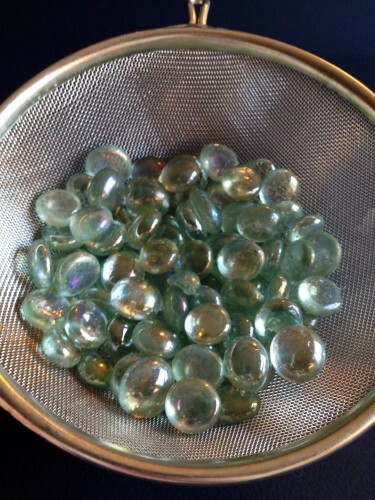 For a final touch I use those iridescent half marbles in the bottom of each votive to support the tiny tea lights that bring these votives to life. As with other Second Helpings projects, one is nice, but more is better. Go crazy! 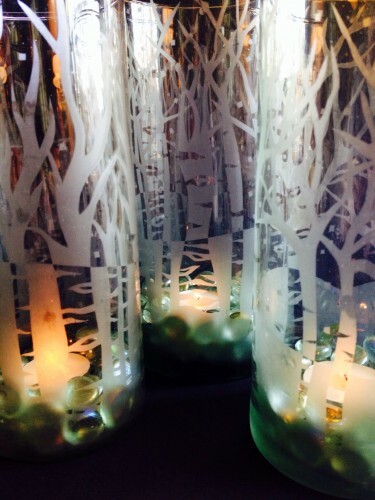 Imagine a winter forest, a snowy night, the warmth of candlelight. It’s a scene you too can create with a little imagination, a few potentially life endangering tools, and a reminder that cozy is also a four letter word.